Adelaide has run a simple bike share program since 2005, known as Adelaide Free Bikes. Whilst this program is well used and liked, technological developments over the past decade have created opportunities for modernising bike share in Adelaide. The City of Adelaide engaged the Institute for Sensible Transport to undertake a technical analysis of bike share options for the South Australian capital. Review various public bike share schemes around the world. The review included: benefits, risks, estimated costs, funding models, system sizes, cost of hire, and operational issues. Elements of ‘best practice’ were also highlighted. Review of current and emerging technology options, such as GPS, Near Field Communication, Mobile Payment, electric assist and dockless systems. Assessment of bike share impacts – both positive and negative. These include the impact on car use, health, safety and emissions. Synthesis of the major factors that motivate bike share users to sign up. A distillation of the key factors acting as barriers to bike share, with a particular emphasis on the experience of Brisbane and Melbourne. Stage 2 involved a facilitated workshop with key stakeholders, exploring some of the contextual factors associated with the development of bike share in Adelaide. A detailed analysis of how recent experience of bike share in Australia and elsewhere may inform a future bike share program for Adelaide. Analysis of catchment design factors including the development of a Bike Share Propensity Index. 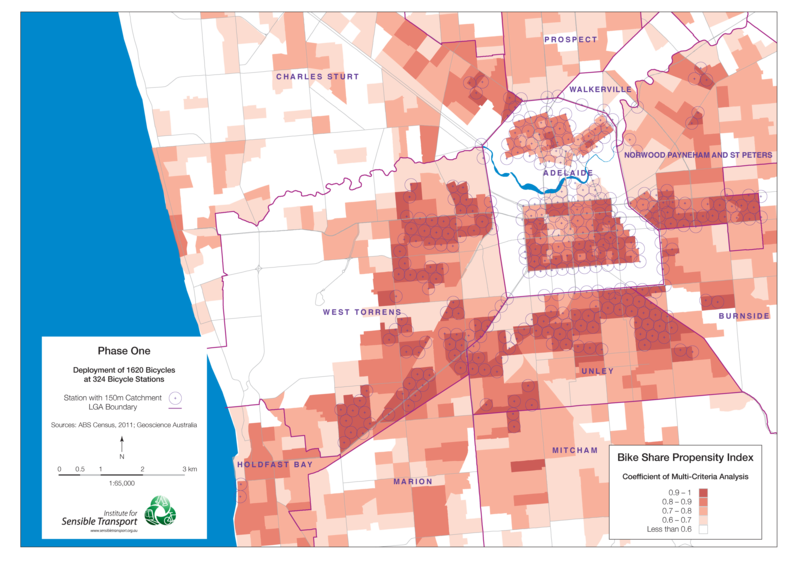 This provided the City of Adelaide with a detailed geographical visualisation of how bike share usage is likely to vary across Adelaide. The Bike Share Propensity Index and proposed docking station catchment is presented below. The report prepared for the City of Adelaide provided a detailed set of design options and considerations for a bike share program in Adelaide, including factors designed to optimise its use. This includes suggested user costs, funding options, number of bikes and docking stations, marketing techniques, estimated usage, technology options, and costs. Finally, a timeline for implementation was recommended, including a series of ‘triggers’ that need to be in place prior to the successful implementation of the scheme. The study outcomes were presented by the report’s author, Dr Elliot Fishman to Adelaide City Council in September 2016.